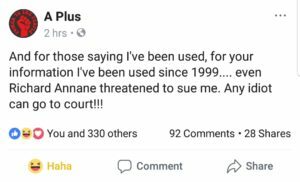 Controversial musician, Kwame A Plus has said any fool can go to court. 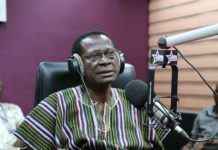 According to the musician and NPP member, he is not afraid of court suits as he has seen it all, revealing that threats of that nature began from his banter with former NPP MP Richard Anane. 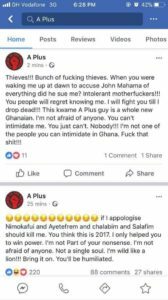 Lawyers for Minister of Communications, Ursula Owusu-Ekuful are demanding an immediate retraction and apology from musician and supporter of the New Patriotic Party (NPP) Kwame Asare-Obeng better known as A Plus for making defamatory comments which sought to cast a slur on the former’s image. 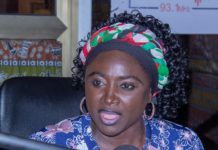 Gary Nimako Marfo of Sarfo&Marfo at law gave him up to June 1 to retract and apologise for comments he made on Facebook on May 23, 2018 accusing the Minister being ‘corrupt” and imputed that “Nyantakyi is only being sacriﬁced to cover up the 89/178 million dollars CVG Kelnl Stinking Scandal”. But reacting to the statement, the musician indicated that he fears no man because he is a different Ghanaian breed and will not be intimidated by any government official. He mentioned that “when you were waking me up at dawn to accuse John Mahama of everything did he sue me?”. On the suit he said “And for those saying I’ve been used, for your information I’ve been used since 1999…. even Richard Anane threatened to sue me. Any idiot can go to court!! !”.